My favorite biome is the lower montane such as what manifests around Lake Tahoe. With the conifers and mountains, the terrain rarely fails to be scenic. And Lake Tahoe in particular turns the montane landscape into an especially scrumptious feast for the eyes. 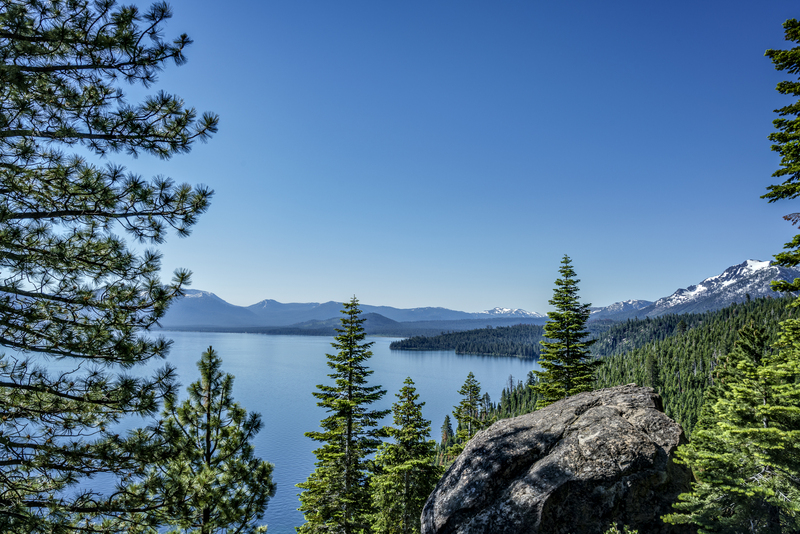 This view, with the pine trees and snow-capped peaks surrounding the lake, is from the Rubicon Trail that hugs Lake Tahoe from Rubicon Point to Vikingsholme. I found it, as I did nearly all the great hikes I experienced in California this summer, using the AllTrails website in conjunction with their iPhone app. I highly recommend it for hikers and adventurers planning their escapades. AllTrails helps find hikes; download maps of them to your phone for out-of-range usage; and track your progress via GPS so you don't get lost, and so you have bragging rights later.